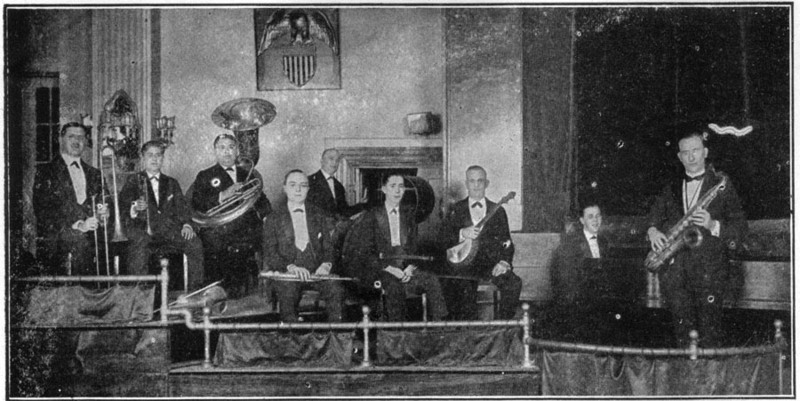 The Isham Jones Orchestra of international fame, now playing at the College Inn of Chicago, has added to its laurels through the records they have made for the Brunswick Phonograph Co.
Isham Jones and his artists, John Kuhn—Sousaphone, Carrol Martin—Trombone, Louis Panico—Trumpet, Joseph Frank—Drums, Arthur Vanaslk—Soprano Saxophone, Leo Murphy—Violin and Saxophone, Charles McNeal—Banjo and Saxophone, Al Eldridge—Piano and Saxophone with Isham Jones on Saxophone—all use Conn instruments in the Gold Artist Special finish. "We are more than pleased with your instruments and consider them unquestionably the best in every particular made today." ISHAM JONES. 1. C. C. Conn Ltd. Musical Truth, Vol. XI, No. 30, Elkhart, Ind., May, 1922, page 14. Are you looking for JONES ancestors? If so, we suggest posting a query to our Community Message Board to get assistance from other researchers.